Richard Nixon famously told a press conference that he was ‘not a crook’. And in the sense that the late US president was never found guilty of anything whatsoever, the statement is factually incontestable. Likewise, Tony Blair is not a war criminal, even though contention to the contrary is a longstanding commonplace among anti-war campaigners, repeated endlessly on social media to this day. Britain’s former prime minister finds the very suggestion deeply offensive, as one supposes anyone might. He genuinely cannot see why he has ended up as the guy whose face is on the placard, as he put it in his interview with Bloomberg TV. Nor does he know why people ‘hate that guy’. What exactly is his mugshot doing being waved at the end of that stick, anyway? But he does seem to know where the blame for all this rests. His ire is directed squarely towards the current Labour leader, patronisingly dismissed as the guy holding the placard. Blairism, you see, is the politics of power; Corbynism the politics of protest. After that, the assault steps up a gear, with the man famously accused by the Stop the War Coalition (StWC) of having blood on his hands attempting to turn that jibe back on StWC’s erstwhile chair. Blair uses a bizarre form of words that seemingly credit himself single-handedly for taking out Saddam. Then he berates Corbyn for sitting back while the barrel bombs rain down on Syria. Although Blair has long been convinced that God will give him a retrospective OK for the hundreds of thousands of killings that resulted from the Iraq, this grisly exercise in comparative death tolls almost makes it feel like guilt has somehow entered the equation. There can be few historical parallels for an attack of quite this degree of vehemence mounted by a former party leader on an incumbent. Yet despite the insinuations otherwise, Corbyn has never been among those hanging the ‘war criminal’ label on his predecessor. Not quite. What he did say, in an interview given to Newsnight last August, was that if Blair has committed war crimes, he should be face war crimes charges. Analytically, such a proposition is difficult to dispute. If there are grounds to prosecute someone for a serious crime, she or he should be prosecuted. To make that point is not to judge the matter in advance. There has also been a more recent article in the Telegraph, couched in ‘the Telegraph understands …’ terms, that Corbyn is preparing to call for Blair to be investigated for war crimes, should the Chilcot report prove damning. On what grounds the Telegraph understand this, it does not tell readers. But again, making ‘preparations to call for’ something to be investigated, should evidence emerge that there are grounds for investigation, is not the same thing as to proclaim guilt. Corbyn is right to be mindful of exact formulations. While the basis for any future legal action against Blair is not nugatory, the chances of the guy holding the placard seeing the guy on the placard in the dock currently look slim. The invasion of Iraq was neither in self-defence against armed attack, nor sanctioned by UN Security Council resolution. As such, it may be construed a war of aggression, making it both contrary to international law and in breach of the UN charter. But not even a war of aggression is not a war crime in the correct usage of the term, as defined in the Geneva and Hague conventions and in jurisprudence. 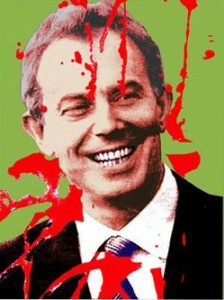 War crimes have subsequently taken place in Iraq, sometimes perpetrated by the very troops Blair sent there. The brutal death of Basra hotel worker Baha Mousa even resulted in the first-ever conviction of a British soldier on a war crimes charge. But Blair is not legally liable for any of this. But just because Blair isn’t a war criminal doesn’t let him entirely off the hook. We are still left with his assertion that endorsing military intervention can be morally superior to not endorsing military intervention. There are even circumstances in which this proposition may be true. But the specific Iraq v Syria comparison that Blair adopts, the better to undermine the guy holding the placard, is not one of them. The sheer scale of the mental disconnect at work is staggering. Blair either does not acknowledge – or, more frighteningly, does not even realise – that there could be any relationship between the course in which he acquiesced 13 years ago and unintended consequences that spill beyond Iraq’s borders today. The invasion, for which Blair bears significant responsibility, ultimately proved a catalyst for the deleterious transformation of an entire region. By sharpening Sunni-Shia rivalries it was a material factor in bringing about Syria’s agony; by creating the conditions for the emergence of Islamic State, it has helped to prolong it. To use the either war rhetorically in the way he has done, in order to discredit the leader of the party to which is still adheres, is as distasteful as it is hypocritical. In no small part, both countries’ troubles have Blair’s fingerprints all over them. Iraq remains to this day the biggest single foreign policy blunder Britain ever made. It’s one of the many reasons why so many people ‘hate that guy’, and Labour has gone with the guy holding the placard instead. Why is Blair given a veto over disclosure of his dealings with Bush before Iraq war? Posted in: Labour, Middle East/North Africa, Politics, War/Defence. Many thanks for your continued commitment to posting eccentric non-sequiturs. Aggression is not a war crime but it is a crime under international law (as the House of Lords admitted in R v Jones (Margaret)). The distinction is important because most breaches of international law do not give rise to individual criminal responsibility. Indeed, aggression is a crime within the jurisdiction of the International Criminal Court. But don’t expect Tony Blair to be visiting The Hague soon, however. The UK has not ratified the amendment to the Rome Statute which would activate the Court’s jurisdiction over acts of aggression allegedly committed by UK nationals and, even if it did, the amendment’s provisions would not apply retroactively. So there’s no forum before which the allegations made against Tony Blair can be tested. Mr Blair has never been one to take responsibility for his actions. He constantly pleads innocence/need but has never addressed the WMD question. Hopefully Chilcott will. I am not holding my breath. Yes, the standard excuse is to claim that the intelligence was ‘wrong’. Such a claim is pure deceit. “The End of the Party: The Rise and Fall of New Labour” by Andrew Rawnsley (Viking 2010), hardback edition. Blair is yesterday’s top down, elite, middle class ‘great man of history’ who was responsible (with Bush’ for what even John Kerry called “the greatest foreign policy disaster ever in history!” Yet still he tries to lecture the World and everyone in Labour! He perhaps should focus on counting his £20m and promoting a dodgy former Communist State which also funds the Yuppie Progress. He only really ever used power for Neo-Liberalism and neglected working class communities leaving a vacuum for others to try to fill as well as probably contributing to voter disillusionment and an increase in non-voters. At least Jeremy has convictions and stands for something but we really need as some on the left suggest to be developing policy and a coherent (and I would add) exciting programme for radical change. So for the future we need to focus on developing progressive policy and developing grassroots members power in Labour. It’s up to us all to push up for this and to get involved and lead from below. Blair thought he would repeat Thatcher’s “Custer’s last stand”, thinking he too could a great white night. That’s the real problem when politician’s egos are bigger than their brain power. The massive destruction we see in the middle east will hang around his neck for as long as he lives- which can never be dismissed as having done the right thing, the evidence of his leading the charge in parliament, saying he had uncontroversial evidence of weapons of mass destruction, and Dr Kelly’s statement of a sexed up document, put’s history incontrovertibly into context. “Fresh evidence has been revealed about how MI6 and the CIA were told through secret channels by Saddam Hussein’s foreign minister and his head of intelligence that Iraq had no active weapons of mass destruction. WW 1 wasn’t too great either. The fact that Blair has announced his intention to “front it out” when Chilcot’s Report is published demonstrates the man’s hubris, nay, mania. If he intends to do so on any public stage, he obviously has a death wish, for it will be a call-to-arms for every wannabe assassin in the country and not before time. As one of the psychiatrists says in that episode of Fawlty Towers, “there’s enough material there for a whole conference”!